The original Howell Old West Conversion Cylinders offer simplicity in converting your favorite steel framed percussion revolver to fire cartridges. Simply remove the percussion cylinder and replace it with one of our cylinders and the revolver is complete. Reloading the cylinder is simple. Remove it from the revolver, take off the back plate, replacing the empty cartridges with the new ones, then reassemble the revolver. The cylinders and back plates are made from Certified 4150 grade steel/416 Stainless steel, insuring strength and durability. All models of our original series conversion cylinders are designed for use with either smokeless “Cowboy” ammunition or Black powder ammunition. ALL Conversion cylinders must be used with STEEL FRAMED revolvers with the exception of the 1851/1860-22LR conversion kit! 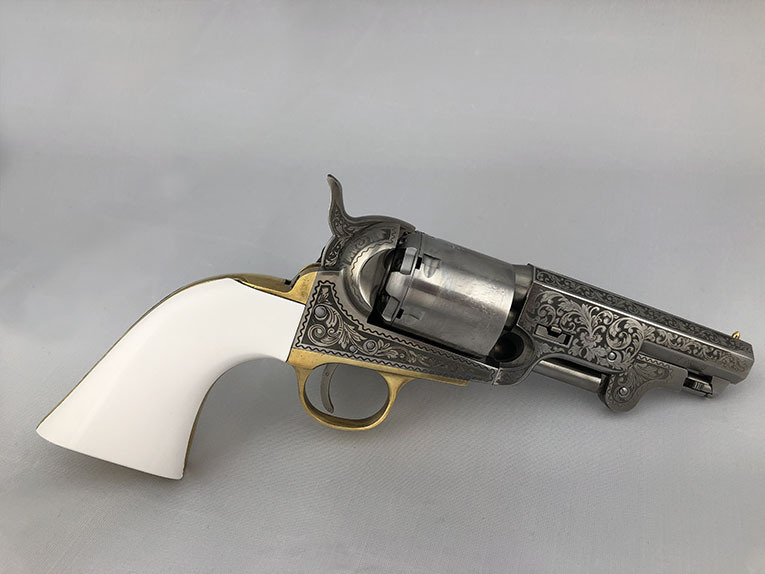 The conversion cylinder gives the owner two revolvers in one! Please check out our Newest addition, the Stainless 1851 Navy Engraved 38 Conversion Cylinder. For more information, CLICK HERE. Our Authentically Styled Custom Gated Conversion Kits allow you to convert your revolver at home, or we can do the conversion for you! We offer a wide variety gunsmithing services, please select SERVICES to see our selection. If you would like more information please call or email.